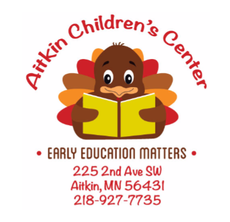 ​The Aitkin School District, in cooperation with Public Health and Lakes & Pines Head Start, offers a free health and developmental screening program twice a year for preschool children at least 3 years of age. The screening is offered in September and January. The Early Childhood Screening (ECS) includes a simple, careful check for: vision, hearing, development, speech, language, nutrition, height, weight, immunizations, and a parent summary and review. This is an important screening to help identify any potential problems that could be addressed by early referrals or treatments. Participation in Early Childhood Screening is required for children to attend kindergarten. A record of the screening needs to be presented prior to a child's entrance into kindergarten in any public school in Minnesota. As an alternative to the school district's early childhood screening, parents may meet the nine requirements listed above by having a health agency provide an appropriate developmental screening. The screening takes approximately 90 minutes if your child participates in all the components. Screening is conducted by certified, trained staff. This is a special time for parents and children. Parents are encouraged to leave siblings at home so that they may participate more easily. If you have questions, please call The Aitkin Children's Center at 218-927-7735.